The Netherlands have a highly developed and well maintained telephone system. The largest fixed telephone line operator in the country is KPN. The cellular phone system is one of the largest in Europe with 5 major network operators using the GSM standard. 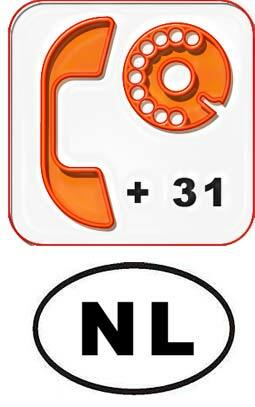 The international dialing country code for Holland/The Netherlands is 31. The international internet country code for Holland/The Netherlands is .nl and SIDN is the organisation that issues and registers .nl domain names. The initials SIDN stand for Stichting Internet Domeinregistratie Nederland – the Foundation for Internet Domain Registration in the Netherlands. The organisation has been responsible for issuing and registering .nl domain names since 1996. The international country code for Holland/The Netherlands is NL and is used at international sporting events, as an international banking code, postal code, on cars, etc. NL is of course an abbreviation of (the) Netherlands.